I decided it was time to address the elephant in the corner of the room. Well, the unfinished project in the bag in the corner of the room. There are about 150 projects I want to make for friends and family for Christmas, but my guilt won’t let me, till I’ve sorted out this out. I have a favourite jumper that finally became beyond the pail last year. 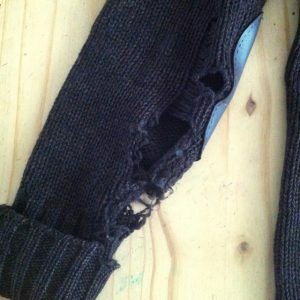 I bought it in 1997, so it’s had a good run, but there’s a point at which no more darning or patching is possible. I love it mainly because it’s very warm (thick pure wool), and has a collar. 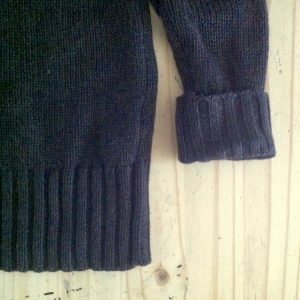 It’s also the right length and the sleeves are tight and not baggy. I’ve never found one quite like it, and alledgedly I have SKILLZ so I thought I should try to make a replacement. Not a copy exactly, but something that shared its good features. Now, I’m a tense and reluctant knitter. I’ve knitted a few jumpers and hats for the kiddies, but I’ve never wanted to take on a large project. I live in terror of dropping a stitch on Row 209 and ruining weeks of previous work. I have difficulty counting stitches on what I’ve done and have no idea how to correct mistakes. 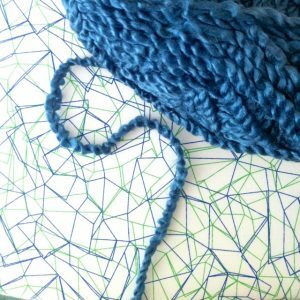 I also find knitting patterns – even more than crochet patterns – often take a lot of knowledge for granted. Like which of the many types of increase/decrease you are supposed to use because apparently they slope in different directions (do they?). So all in all, I knew I had to find a pretty simple pattern and in a heavy yarn, or I’d never finish it. Plus it had to be free, obvs. Enter ‘Ginny’ by the lovely people at DROPS design. This fits the bill of being in a super-chunky yarn, and having a collar. It’s also worked in the round which, whilst making me a bit nervous, is preferable to having to sew up side seams which I can never manage to do invisibly as you are supposed to. 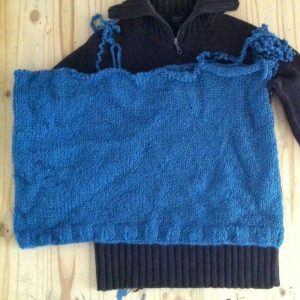 Not trusting my abilities very far, and not having the budget anyway for this quantity of woollen yarn, I decided my first jumper in a cheap yarn should be a working prototype. 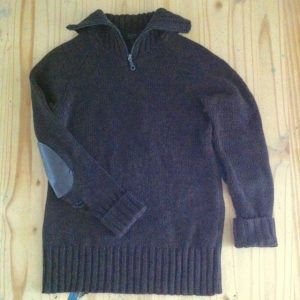 Once I’d worked the pattern out making this first attempt, if I liked the result, and maybe after further tweaking having seen it made up, I could then invest in some quality wool yarn and make my definitive ‘forever’ jumper. The yarn I chose – on special offer and now discontinued I think – was this King Cole Maxi-Lite Super Chunky. It is very soft and light, not at all the robust finish I’d prefer, and I now realise that its very visible plies make it all but impossible for me to count rows. The perils of only being able to buy yarn online. But it was cheap, and a lovely colour. My budget also had to stretch to 7 & 8mm cable needles, so I decided to go for ones with interchangeable tips as a future-proofing exercise. Like a good girl, I did a gauge swatch and found my tension was tighter than the pattern required. The pattern calls for 11 sts x 15 rows, my tension is apparently 12 sts x 21 rows. I don’t know if that is even possible. But my maths told me I needed to make a larger size to have it come out the size I actually wanted. So I cast on 150 sts, which is in fact the XXXL size, hoping to end up with M-L.
With a year’s hindsight, it seems obvious that this wasn’t going to work. I did start to wonder if it was coming up a bit large, but I knew I needed to work enough to get a proper idea. I think I was in denial. At this point I thought maybe I had to accept that somewhere my calculations had gone wrong. Those of you who craft in any medium know the heartbreak of finally having to admit something’s not working. Inevitably the half-made giant jumper went into its bag, and didn’t come out again. It just hung on its peg, making me feel guilty every so often. But this week I’ve taken a deep breath and decided to start again. Apart from anything else, our house has just entered its default setting of cold-and-damp, which will last until May, and I need a jumper! 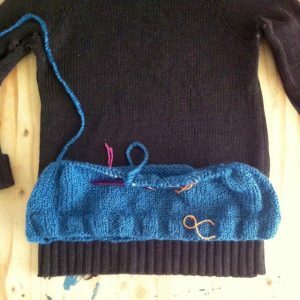 I’ve re-started by casting on 126 sts (the XL size) and – so far – it’s looking more sensible. I always count rows religiously when I knit and place lots of markers in different colours which I write down, to keep track – its’s all the more necessary with this yarn. I don’t think I was on Ravelry when I was last knitting this jumper. 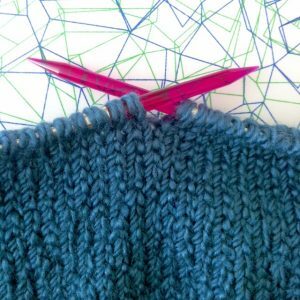 It’s slightly depressing that other makers of the the Ginny jumper all say what a quick project this one is – not for me it isn’t! But I just desperately want it done and dusted so I can get on with the things I really want to make. I’m hoping that ‘going public’ with this now will also provide an additional spur!